We’ve recently received the Sigma MC-11 Sony E to Canon EF mount adapter which promises full autofocus functionality for 15 Sigma Art Lenses on Sony E-mount cameras. What the Sigma MC-11 brings to the table is the ability to use face detection, eye recognition, and the use of continuous phase detection autofocus in video mode. This means being able to use a third party lens just like you would a native FE mount lens, which is a new luxury that makes e-mount cameras even more versatile. It’s great news for Sony users that want a larger lens selection for video and stills but are not attracted to the limited capabilities and high failure rate of the Metabones adapters. The Metabones adapters give a tempting promise of being able to use the larger Canon, Nikon, and Sony A- mount on smaller mounts like the micro 4/3 and Sony E-mount. Many times they work and provide aperture control and support image stabilization, but we have routine problems with these adapters that can be quite frustrating. The most common being a loss or lack of electronic connection between lens and camera, sometimes creating errors and freezing in the camera. The adapters also regularly have screws coming loose and other functional issues. We state a warning to customers on the individual product pages discouraging against relying on the adapter for the success of the shoot. We would like to find out how well the new Sigma MC-11 performs for video and stills shooters, and how it holds up over time. If it’s built well and works well shooting Sigma Art lenses we are happy. That alone really triples the number of fast AF primes. And when I asked Roger what he wanted from the adapter he told me, “I just want to be able to shoot a Sigma 35mm f/1.4 on an A7RII.” The Sony FE 35mm f/1.4 has a lot of sample variation and tends to be tilted, and Roger’s eyes are old and tired. It also costs more than the Sigma 35mm and Mc-11 combined. Similar stories for the rest of the lineup, Sigma is beating out Sony either in optics, price, or selection, so the chance to use these on the Sony cameras is quite exciting. The Sigma MC-11 is solid. The release knob is in a convenient and easy to reach spot and seems very well built. The adapter mounts to both camera and lens with ease and there is little no wiggle when a camera, adapter, and lens are all attached. Common problems we have had in the past with the build of the Metabones adapters are mount wiggle and failure of the release knob. The Sigma already seems to be a bit more rugged. In the video below you can see a comparison between a Sony FE 55mm f/1.8 on an a7RII and a Sigma 50mm f/1.4 + Sigma MC-11 adapter on the same camera using the same settings. The autofocus on the camera itself isn’t the best for video, but both setups performed about the same, with the native mount lens coming out slightly ahead. We also explored the exciting new opportunity to fill the current gap in the Sony FE lineup of super-telephoto length lenses. 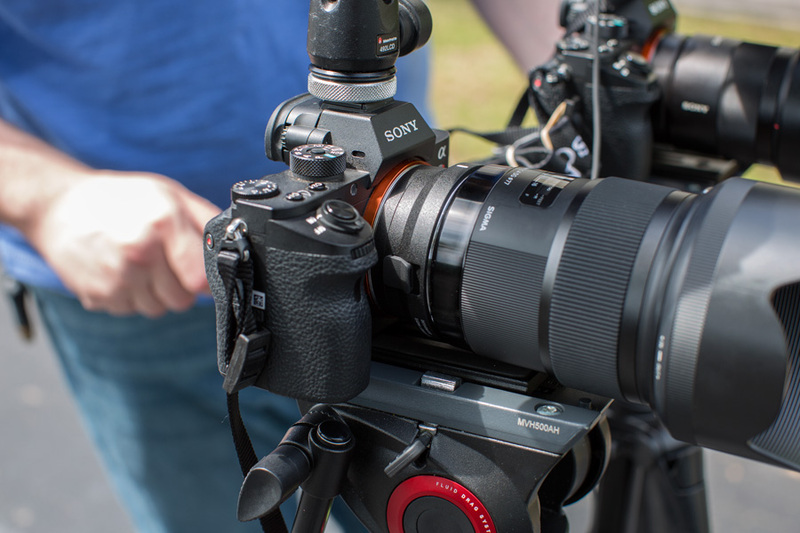 One of our photo techs, Nick, tried the adapter with a Sony a7RII camera and a Sigma for Canon 120-300mm. We again found that the adapter could keep up with the potential of the lens and camera’s capabilities. Note: Because we have not had the adapter for very long we cannot give a realistic failure rate or say for sure that it won’t have the same connectivity issues that the Metabones has. You know the ones: no electronic connection, “please clean contacts”, no irising, oops now your entire camera has shut down. But, we haven’t had any problems so far. Can I Use My Canon Glass? Sigma states that the adapter is only to be used with Sigma brand lenses, but out of curiosity I tested a few Canon lenses to see what the adapter would support. I took a handle full of popular lenses and put only one copy of each on the adapter so the results I got may be different from what may happen with someone else in another situation. I found that autofocus worked on all of the AF lenses that I tried. The focus modes and focus points were limited though, and the camera would not go into flexible one-point focus to use any of the points on the outer edges of the frame. The AF speed was good, and face detection was active. The image stabilization also worked fine with all three relevant lenses. I also tried a tilt-shift lens in full tilt and shift positions to check for vignetting and all is good. One lens that did give problems was the Canon 50mm f/1.2. The metering was way off causing the images to be overexposed. After going back later with a different copy of the lens the metering was fine, but I did notice that the aperture only opened to F/1.3. Same deal with the Canon 85mm f/1.2. And checking the Canon 50mm f/1.8 I found it opened up to f/1.7. Why would this be? We aren’t really sure. Siggy just being weird. But in short, we can’t recommend you try anything but Sigma lenses with this adapter. Sigma MC-11 or Metabones Adapter? If you are shooting with Sigma glass the answer is pretty clear that you would want to use the MC-11. You may even want to switch to Sigma glass just to use it. The build quality is better, it supports the full range of AF modes, and with limited use but a trust in the Sigma brand, this adapter will likely be more reliable. The Sigma MC-11 is an exciting companion to the impressive Sigma Art Series lenses. The technology is great, and would be even more useful if made compatible with other brands. It’s built well, brings more lens options to E-mount users, and seems to work really well. I’m excited to see what future firmware updates bring, and for now this will be my choice adapter. Speaking of updates, any thoughts on the 100-400? Thinking of that combo with an A7. I have used this with a 17t/s , 24 t/s, and 90 t/s and haven’t noticed any problems. even with heavy tilt and shifts – though I am stopped down. The commlite losses connection sometimes and can set aperture to the setting of the previous lens used. It is also blurry in the corners regardless of f-stop. This renders it unusable. Additionally the commlite, viltron and fotodiox are not flocked, and this results in massive internal reflections. The sigma is flocked, and has no issue. The sigma is currently $149 and that’s where I’ve put my money. In the time since this very informative article was written there have been firmware updates to the MC-11 and some Sigma lenses. I’d be curious to see an update to this article. With A7RII and A6500, I use the MC-11 with the Sigma 24-105 (works great, consistently) and the just-arrived-today Sigma 100-400 (haven’t used it enough to form an opinion). For comparison’s available to me, I have a number of native E-mount FE lenses and Sony & legacy Minolta lenses and the LA-EA4 and LA-EA3 adapters. I’ve settled on the A7RII + MC-11 + Sigma 24-105 as my walk-around lens, it’s that good. I’ve been using the Tamron 150-600mm on my A6300 and A7Rii with the LAEA3. Have you had a chance to compare how the combination of the Sigma 150-600mm C for Canon and the MC-11 compares to the Tamron/LAEA3 combination with those Sony cameras? Can you please check and see if PDAF is available for the A7 mk1? For whatever reason Sony has not allowed PDAF to work on any adapter so the focusing is much slower. – 3 adapters Metabones IV, Viltrox and Commlite never reached the infinity mark on the focusing scale window on the lens. The Metabones is the closest. It appears that the Viltrox and the Commlite are thinner than the Metabones. – With the MC-11: I had to turn the focus ring to PASS the infinity mark on the focusing scale to archive the same focusing plane with 3 previous adapters. I don’t have any measuring equipment but to my eyes the MC-11 is even a little bit thinner than the Metabones. – About image quality: we all know that using adapter will cause some problem with image quality, especially with UWA lens. In my test all 4 adapters showed similar sharpness in the center, but in the corner, the Sigma MC-11 is the worst (the Viltrox was the best, produced even sharper corner than the MB IV but maybe I just have a bad copy of the Metabones). I could manage to get the sharp corner with the MC-11 by using focus peaking at the corner, but at wide open (f4) the center was defocused, only at narrower aperture (f8 to f11) depth-of-field was large enough to cover the problem. Repeated the test will all focal length up to 35mm, only at 35mm the problems seemed to go away, 4 adapters were equal. My conclusion: Sigma MC-11 adapter may not good for UWA lens or maybe it wasn’t designed to work with non-Sigma lens in term of optimal image quality. I wish I had the Sigma 20mm Art to test but it’s hard to find and borrow one in my country. How does it work with older (non-art) Sigma lenses such as the 85/1.4 ? Bizarre that the 17-50 2.8 doesn’t work. A real shame as that is a workhorse. Also a shame that the adapters have problems. I had contactor problems with my Techart but I wrote that off to it being a Techart. Interestingly enough I only had contactor problems with my Tamron 28-75- the Canon 50 STM worked like a charm and never gave me problems, leading me to believe that Canon lens mounts are made with tighter tolerances than 3rd party lenses. 3rd party lenses are tight enough to work with Canon DSLRs but not EF adapters. In any case I hope it’s just a 3rd party fluke. I am saving up for an A7 II and a bunch of Canon glass. I would be furious if it all didn’t work well together. Yes, this is how the adapter performs. There is noise, but nothing that can be heard over a conversation. It sounds much louder in your video, but it is something to keep in mind when silence is crucial. Thanks Sean, I’ll keep those suggestions in mind. I didn’t do much testing with Canon lenses, especially longer ones, as I don’t want to recommend that combination. Hard to say what caused the difference in stabilization performance; I’d be interested to look into that. Thanks for your thoughts! 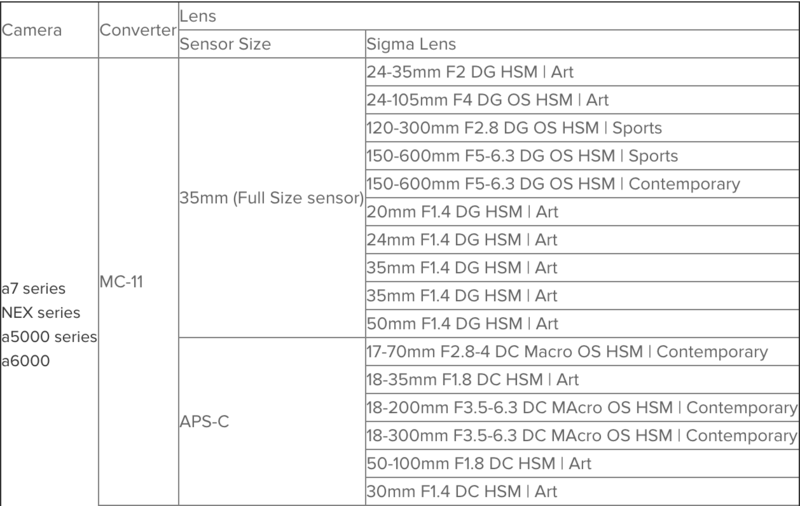 Regarding the aperture reporting, I believe that for adapted lenses Sony doesn’t vary from the 1/3 stops. If you change the camera to use 1/2 stop increments you will get a different figure reported for those lenses wide open. It doesn’t affect how far the lens opens, just a display/EXIF thing. For older Sigma and all Canon lenses obviously they can’t do that, so they default back to the metabones-style middleman adapter, translating between the two systems. Just regarding the stops thing, if you change the Sony to read out F/numbers in half-stops instead of third-stops (Exposure step in the menu), it will display f/1.2 and other half-stop denominations. Also for your AF tracking test, consider setting “AF Drive Speed” to fast, and “AF Track Sens.” to high. I think some of the missed focus you experienced may have been due to the camera trying to keep focus “sticky” on the background. Or, of course, I could be wrong! Interesting review, thank you Sarah! Just wondering whether anyone has tested this with the original A7R? I’m expecting the AF to be poor, based on the lack of PDAF. Is it? My experience so far with the a6000 and the Sigma 150-600mm C is good. I’ve been three days in the field (only static subjects), plus some preliminary test hours, and I didn’t experience any fault (the camera never froze, no lost connection, all EXIF data fine, etc…). Stabilisation seems to work fine, even though I’ve mostly shot with the beanbag, so I don’t have solid statistics in this area. AF sometimes misfocuses, but it could be a lack in contrast of the subject with long focals; I’ve experienced it also with the SEL70200G, even though less frequently. Another question – with the Metabones IV adapter in Green mode, I can see the DOF effect of different apertures looking through the EVF. I can also use the “wide open button” to make it easier to focus. I don’t recall there being something equivalent on the MC-11 (at least not that would work with Canon glass). I had issues with canon lenses that had image stabilization built in – specifically the 100-400 II IS and the 70-200 II IS. There was very little stabilization on the MC-11 compared with the metabones IV. Do you have any thoughts on why this would be the case? In both cases the image stabilization on the lenses was turned on.